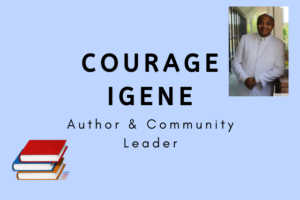 With experience in community work and motivational speaking, Courage Igene has established a successful career as an Author and the Founder of All Nations Church. Born and raised in West Africa, Courage Igene has lived in the United States for the majority of his adult life. Throughout his life, he has become familiar with individuals from a variety of cultural backgrounds. This has helped Igene to develop multi-faceted elements in his authored works. As Founder of All Nations Church, he travels across the nation spreading stories of worship and spirituality. Since his early childhood, worship has been the focus of Courage Igene’s life. At a young age, he instinctively knew that his passion for religious services would be unwavering. As an adult, he founded All Nations Church, a place of worship and center for revolutionary religious experiences. Spreading his love for God with fellow believers fuels him. Dedicating his energy to All Nations Church has become an integral part of Courage Igene’s identity. The basis of All Nations Church is to promote healing through religious worship. Members of the church are amazed by Igene’s healing rain services, which have rejuvenated and comforted many people. In his mission to spread his message of healing through God, Courage Igene often attends public speaking events across the United States. But in order to spread his message globally, he has authored a variety of religious texts. His written works reflect on the lessons he has learned from his experiences as a dedicated worshipper. He hopes that these books will help to carry his message all around the world. The same passion and energy found in Courage Igene’s speeches is translated magnificently in his published books. He has experienced the process of publication on multiple levels, from self-publishing and beyond. He is happy to lend his expertise to any aspiring authors seeking publication through the Bartering Exchange Network!